Unfortunately, unless a vessel in Miami is authorized to carry more than six passengers by the United States Coast Guard, it may not. There are very few fishing boats that can comfortably transport more than six people and safety is the main priority. USCG safety regulations are in place for good reasons and our Miami Fishing Charters comply with them at all times. Head boats, or party boats, are the first option. These boats are bigger than average and can transport more people. We have a 45ft Stapleton in our Miami fishing fleet that is allowed to carry over twenty people, and it does so comfortably. These types of boats typically take everyone drift fishing, which is very exciting. Once everyone is onboard, we take them out to sea where their engines are switched off and the boat is left to drift. Your group can throw their lines over the side and catch tasty, powerful fish such as grouper, snapper, jacks and various sea basses. There is a downside to this option though. Due to the size of the boat and the fact that it is drifting in the water, you will not be able to chase truly exhilarating big game fish offshore. The techniques required to catch them are also impossible to use when fishing this way. Sportfish boats are the second option. Our Miami fishing fleet has a multitude of these smaller boats on offer and your group can split up and go out on several of them. These boats will allow you to get farther offshore where you can utilize specialized techniques to catch the most thrilling fish of all. These include mahi-mahi, swordfish, sailfish, shark, tuna, wahoo, kingfish and many others. The ability to get further from shore opens up so many options for you to catch large numbers of absolutely fascinating fish. There is a radio on every boat that keeps your group in constant contact, and we have fun and exciting activities to keep your group feeling as one. Our mini fishing tournament is easily the most popular and it involves groups competing against each other from different boats. Usually the goal is to catch the biggest fish, the most fish or a particular species of fish. If you do not wish to split your group up then we can customize the perfect drift fishing charter for your group in Miami. We recommend choosing the sportfish option if you can. Many more fish can be caught and the experience is far more thrilling. Either way, your Miami Fishing Charter will be an adventure you will remember. Call today to book your Group Fishing Charter in Miami and experience the adrenalin. There are very few fishing boats in Fort Lauderdale that are allowed to carry more than six passengers. The United States Coast Guard has set this rule to maximize all life at sea, both yours and those already living there. Safety has always been the most important aspect of any deep sea fishing charter, and our Fort Lauderdale Fishing Charters make no exceptions to this rule. Only USCG “inspected” vessels are allowed to transport more than six passengers and we have a 45ft Stapleton in our Fort Lauderdale fleet that meets this criteria. It is authorized to carry over twenty people. This is our standard head boat, or party boat, and is set up for drift fishing. Everybody climbs onboard and we head out to sea where we switch off the engines. Lines are thrown overboard and your group can have an exciting time catching as many fish as possible. Usually they catch fish such as snappers, groupers, sea basses, jacks and others. This does limit everyone in the types of fish that can be caught. Due to the fact that the boat is drifting, it is impossible to chase big game fish offshore. It is also very difficult to use any of the techniques that these fish require. The other alternative is to split your group up and go out on various sportfish boats in our Fort Lauderdale fleet. These boats are smaller and can chase fish farther offshore. They are able to move around and specialized techniques can be used easily. You can catch truly thrilling fish from these boats, including fish such as tuna, swordfish, sailfish, shark, mahi-mahi, kingfish, wahoo and others. The boats are in constant radio contact with each other and we have various activities that will keep your group together. The most popular of these is our mini fishing tournament where groups compete from different boats for the most fish, the biggest fish or a specific type of fish. We recommend using multiple sportfish boats for groups on our Fort Lauderdale Fishing Charters. There are so many options available to you and you have the opportunity to catch larger numbers of more exciting fish. If you group needs to remain together on one boat, then we can certainly customize the perfect drift fishing charter for you in Fort Lauderdale. Call today to book your Group Fishing Charter in Fort Lauderdale and experience true adventure. Thinking about booking a fishing charter in Fort Lauderdale or Miami? How's this for an incentive: book a charter on select boats between now and February 15, 2013 and mention this ad and we'll throw in an extra hour of fishing at no additional charge. This is a full extra hour out at sea, which will give you the chance to catch many more fish. It's sailfish season so make the most of it! The fine print: Charters must be booked by 2/15/13. New bookings only. Select vessels only. Subject to availability. VIP Fishing Charters is proud to offer a luxury fishing charter to the Dry Tortugas. The Dry Torgugas are a small group of islands located at the end of the Florida Keys, about 70 miles west of Key West. The Islands were discovered in 1513 by Ponce de Leon and provide some of the best fishing grounds imaginable. 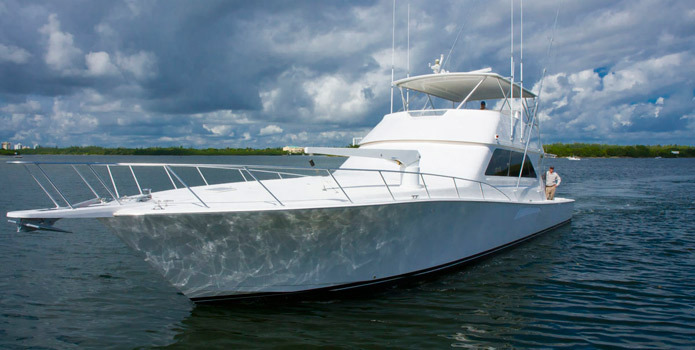 Our Dry Tortugas luxury sportfishing boat is a six year old 42' Silverton Convertible. This boat is fast and can reach the Dry Tortugas from Key West within 3 hours. Two staterooms can accommodate a total of four guests as well as the captain and the mate. The 3 day 2 night Dry Tortogas fishing charter is the perfect getaway. Guest can choose from a tour of the historic fort, diving the exotic reefs and crystal clear waters or go straight to the world class fishing. The crew would be happy to cook your fresh catch for dinner on the boat. Below are some pictures of our Dry Tortugas fishing boat. OK, I'll admit it, I'm a boat snob. I've grown up on boats, my family is in the marine business, and I've seen a lot of awesome boats ranging from small, nimble sailing boats to 450 foot private mega yachts. As such, it takes something a little extra to get me excited. When I first saw the 65' Viking "Platinum Edition" sport fishing yacht my heart started racing faster, I thought could this be the ultimate fishing yacht for our VIP corporate clients ? "What does the platinum edition mean?" I asked the captain. Starting from the stern, the fishing cockpit is huge. It is thoughtfully covered with a large top to keep you cool and shaded from the beating Florida sun. Forward of the cockpit there's mezzanine seating so guests that aren't fishing can get a birds eye view of all the action. Just forward of the fishing cockpit you'll find the beautifully appointed main salon where there's a ton of space for entertaining. There's a large leather sofa, flat screen TV, dining area and galley (kitchen). Down a flight of stairs are three staterooms, accommodations include a huge master stateroom which features a private den appointed with a leather couch, book shelves and a flat screen TV. The second spacious stateroom is to starboard and is equipped with another private head. Forward is the third stateroom offering comfy V berth accommodations. Many of our clients want and need more then just a fishing boat when they're entertaining their guests and this magnificent sport fishing yacht is the perfect platform to do just that, mission accomplished! As for the fishing, the captain and crew have been fishing the beautiful gulf stream waters off South Florida, the Bahamas and the fabulous Florida Keys for their entire lives and have been professional captains for decades. They both have great personalities and are comfortable dealing with VIPs and celebrities. On a typical trip, expect to catch anything from sailfish, swordfish, tuna, mahi, kingfish, wahoo and more. Your crew will happily clean, fillet and package your catch and if you'd like, they can even have one of our local waterside restaurants prepare dinner where you can dine on your catch of the day (what a great way to end your day of corporate entertaining). As I'm writing this article the yacht is completing a refit, where additional upgrades to the mechanical equipment are being made and she is getting fresh bottom paint and top to bottom detailing. It's hard to imagine that this yacht could be any nicer, but the captain and owner have high standards, which frankly is what we demand for yachts of this level. One of the most exciting things about this sport fishing yacht is the charter price. Typically, yacht charters are quoted with a base price plus crew fees, catering and all the other expenses associated with chartering. Our corporate clients particularly those who are utilizing expense accounts need to have an all in price. We've worked with the owner to create an "all inclusive" price that includes not only the boat and crew, but also includes a continental breakfast and lunch service as well as ice cold beer bottled water and soft drinks. But don't worry, we can accomodate special requests such as additional catering with server, ground transportation and even a video photographer to capture your clients and guests sport fishing adventure. Our all inclusive price is for up to eight hours and can be billed in advance right to your credit card. There's a twenty mile maximum range, which is more than adequate for most trips. The boat is docked in Aventura, Florida, but can easily pickup guests at other marinas and hotels from Fort Lauderdale to Miami (additional delivery and/or landing fees, may apply). In our efforts to find the best fishing boats, fishing captains, and fishing guides around, we've noticed that there really isn't a complete list of all the fishing boats in Florida, and certiainly not for the rest of the United States or the world. There seem to be a number of fishing directory sites out there, but a lot of them have outdated information or require a fee for listing, which discourages participation. We've decided to compile our own fishing charter directory using the information we find on and offline. We're also going to set it up so that users can post to the directory as well. Hopefully, over time this will grow into a good resource for anglers. We feel it would be helpful to have a comprehensive directory with boat names, boat types, boat sizes, and reviews of fishing charters. Since we don't represent or recommend every charter out there, we think it would be good for people to have access to an independent site where they can freely post reviews and see all the boats available in a given area. Building a directory like this is a side project so please be patient as we work out the kinks. Our main business remains finding the best fishing charters out there, so if you are looking to go fishing in a specific location please give us a call!